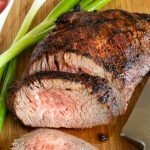 Full of flavor and simple to make, this Easy Seasoned Tri Tip Recipe cooks in no time and yields tender smokey seasoned beef that is great for entertaining! This Easy Seasoned tri tip recipe is a grilling staple in our house. 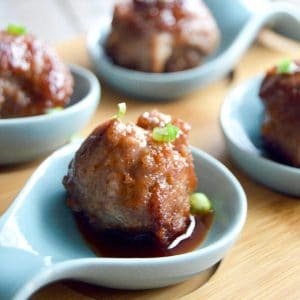 Not only can you get it on the table quickly, but its made with an inexpensive cut of meat that makes it ideal for entertaining! Grilling/Barbeque is really popular in our house. For the most part it tends to be healthier and it uses a lot less dishes than cooking inside which makes it a winner in our house! This triangle steak/roast is flavored with a few simple spices and grilled quickly so you have a crust of spices on a juicy slice of beef that when you cut it across the grain is really tender! 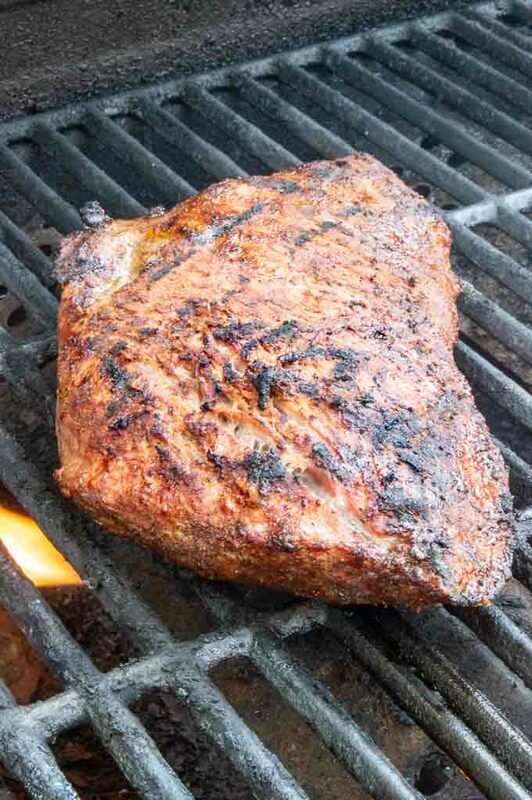 The seasoning on this tri tip is rich and smoky from some coffee and chipotle chili powder. There is also dry mustard, salt, garlic and onion powder to balance it. Its not spicy at all but full flavor. The seasoning also works really well on grilled shrimp and chicken. 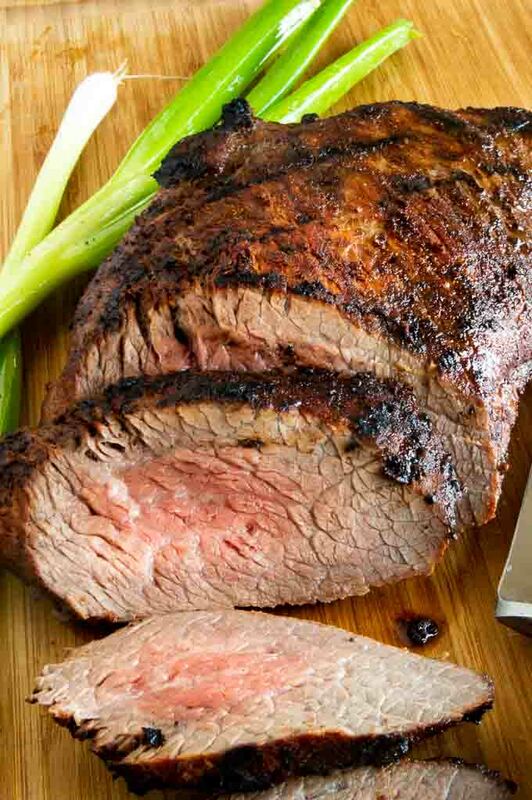 Tri-tip is the triangle section of the sirloin where it meets the round and the flank. There is a photo here at Certified Angus beef showing you where it’s cut from. There is very obvious marbling and some fat on the outside. I choose to trim the visible chunks of fat to avoid grilling flare ups. The cut looks like a brisket in marbling, but there is not a fat cap on the triangle shaped cap. Tri tip, when cooked to no more than medium rare and cut across the grain is very juicy and tender. If you prefer a more well done steak, this is not the recipe for you. (although you can use this seasoning on anything!) 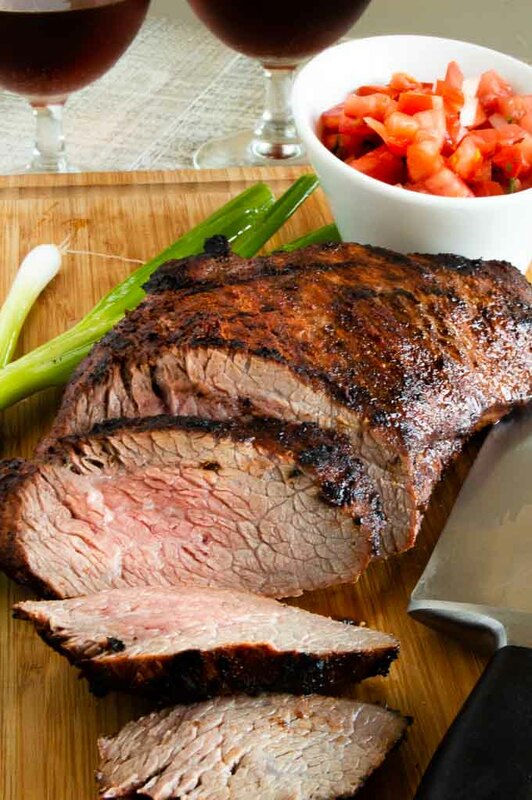 This tri tip steak recipe is seared on both sides, then cooked to rare/medium rare. If you overcook it, it will be very tough. 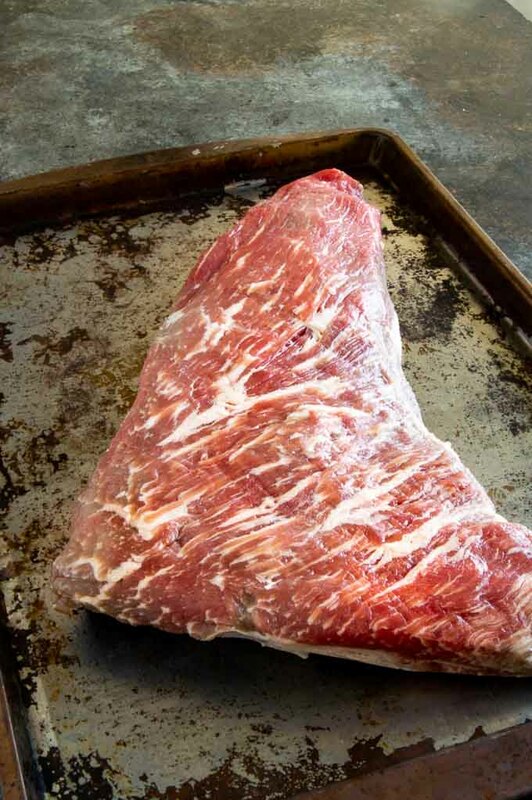 Because the tri tip is triangular in shape, there will be an end that is smaller and will be a little more done and still be tender… it tends to finish to medium and by letting the steak rest it will have plenty of juices. Mix Seasoning, sprinkle over the top. Massage seasoning into both sides of the tri tip roast. Let set for 60 minutes to overnight, wrapped in foil in fridge. Slice Meat against the grain about 1/4 -1/3″ thick. 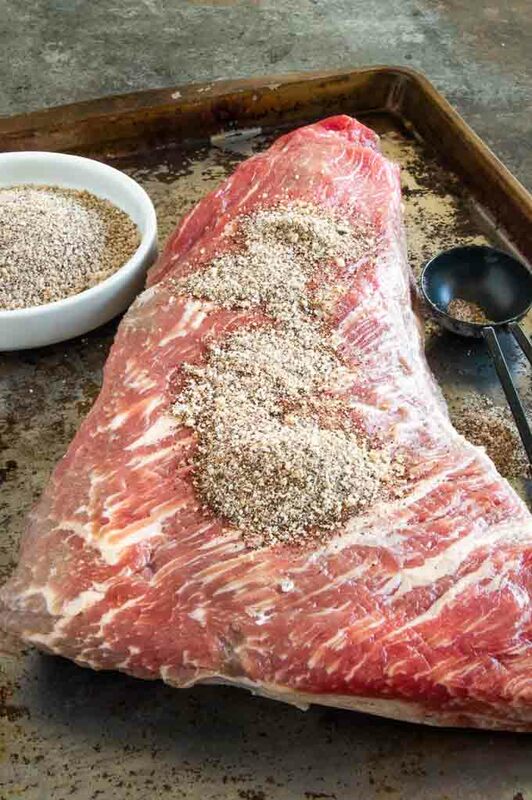 PRO TIP: Cutting across the grain is critical in this triangle roast cut of meat. You can usually see the grain line on the top, but I usually make sure the fist cut is easily stretchable. Can you cook a tri tip roast in the oven? Yes! You’ll season as the grilled version but when ready to cook preheat the oven to 350°. On the stovetop in a cast iron skillet, heat the skillet to high. Sear for 3 minutes on each side. Then place in the oven and cook until desired doneness(see the chart below.) About 10-20 minutes average on a 3 pound roast, but use a thermometer for exact doneness. What internal temp is ideal for this tri tip recipe? **** Although I provide the temps from Medium….I highly recommend rare or medium rare at the most for the internal temp to maintain tenderness and have it be juicy and not dried out. If you have people who prefer more well done, you can serve them the smaller tip of the triangle which will be a little more done. Pin this to your Easy Meals for Entertaining on Pinterest! Lets Be Friends …. follow me on Pinterest for more ideas for stress free entertaining with confidence! Trim any excess fat from tri-tip. Into a small bowl mix all spices and blend well. 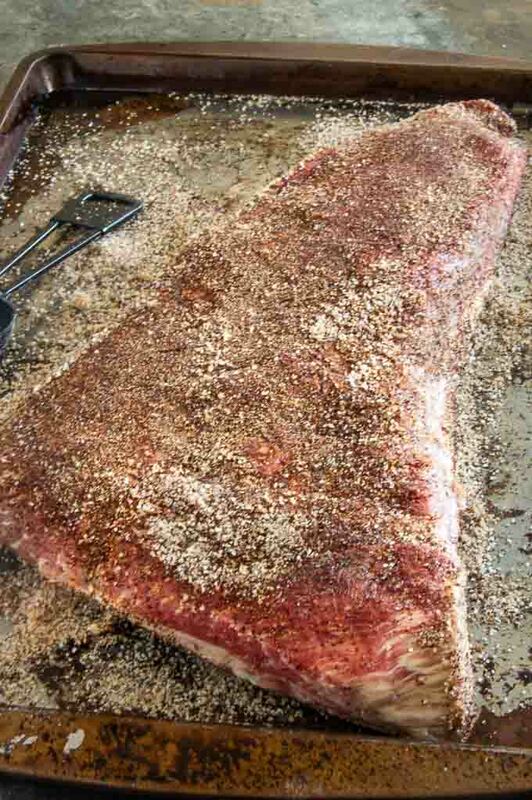 Sprinkle spices on each side of tri-tip and using your fingers rub the spices into the meat. 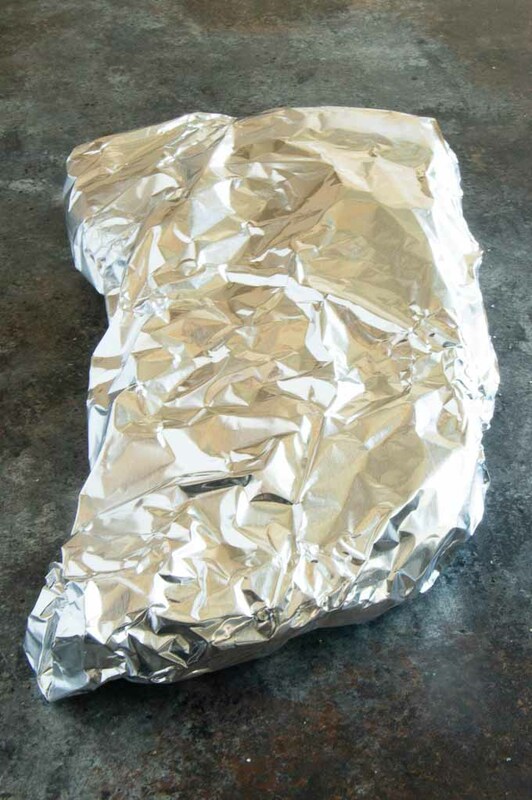 Place roast onto a sheet of foil and wrap tightly. Allow to set for 60 minutes minimum, up to overnight. One hour before grilling remove from fridge and allow to come to room temperature. Heat grill to high. Place roast on grill and sear for 5 minutes each side. 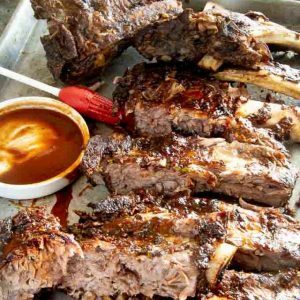 Ideally on your gas grill you will have one area you can turn off the gas and allow meat to cook without being on the flames (indirect cooking it).If you dont have that option, place the meat on the cooler area with out as many flames. Close the lid and cook for 5 minutes at a time coming back to check to make sure the flames are not burning the meat. Depending on the size and width of the roast will determine how long it takes to cook your roast. Use a thermometer to cook to 5° before desired doneness. For Rare, you want to remove at 120° (during rest time it will continue to cook to 125°‚. Medium rare 130° (rest temp finish 135). Medium 140° /145° rest temp finish). Any more done than medium the meat will be too dry. Once roast hits your desired temp, remove from grill and allow it to rest for 10 minutes. Cut meat into slices against the grain to maximize tenderness. 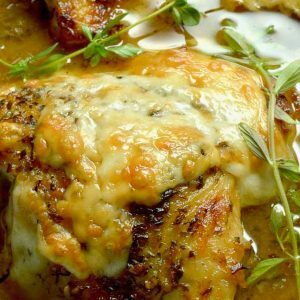 This recipe was fantastic and we were very happy with the outcome. We used cumin seeds and smoked paprika and will definitely make this again. I will be making this tri tip recipe again. It turned out so tender, juicy and tasty. This recipe is a keeper!!! That tri tip is perfectly cook and I love all of your tips and tricks. No more going to the BBQ joint, now I can make it at home. Thank you! We grill tri-tip a lot and you are right about the meat being popular in California! Your rub is delicious and so simple. I think I’ll add it to other cuts of meat too! I love searing meat and sealing in all those juices! This cut used to scare me and now I love it!! Love the flavors in this simple seasoning! 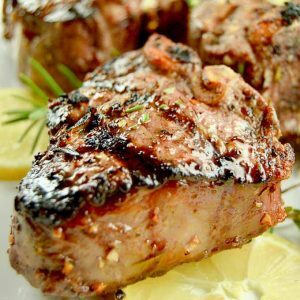 I really love grilling in the summer and so glad to come across another great grilling recipe! Everything you make on your grill makes my mouth water! Tri-Tips aren’t a cut I typically make but you can bet your bootie I am buying them this week. These look stellar! I want to put this tri-tip on EVERYTHING! it is so good! I am drooling over this tri-tip!